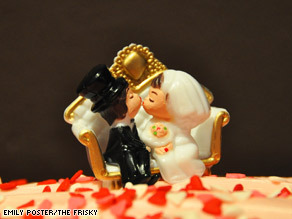 (The Frisky) -- One thing I learned before I got married is that nobody loves to talk about weddings more than women who just got married. They'll grab on to any socially acceptable opportunity to relive their experiences. Bridal magazines, Web sites are not your boss. One tells brides to order the cake too early, author says. Now, I'm one of those women who's full of tips on how to get through your wedding day. One day, maybe you can pass a few of these dos and don'ts on to the next girl when you go to blab about your wedding. 1. Put up with crappy sales service from wedding vendors. I decided not to go to one bridesmaid dress store because the lady on the phone was so rude to me. I wanted the experience to be as pleasant as possible. Note: This does not give you carte blanche to be a bridezilla. It means you should patronize companies that make you feel at ease. 2. Spend money on things for your wedding day because magazines tell you to do so. If you love your perfume, you don't need to get a special new one for the special day. If white wine is your favorite drink, no need to freak about a signature cocktail. 3. Be afraid of bridal magazines. Even if you're the indie-est indie bride who ever lived, you still need ideas for things like the cake and flowers. Magazines are great for this, even if you think the articles are silly. (I liked Martha Stewart Weddings and InStyle Weddings.) The Frisky, InStyle and CNN are all part of Time Warner. 4. Think The Knot is in charge of your life. You are in charge of your life. Also, The Knot thinks you have to order your cake way earlier than you actually do. 5. Buy a dress in a size smaller than you are and think you'll shame yourself into fitting into it by the wedding. No offense, but if you haven't lost the weight by now, how are you magically going to do it by your wedding date? Buy a dress that fits and dedicate yourself to taking good care of your body. If you happen to lose a ton of weight by the wedding day, get your dress altered. 6. Be afraid to ask your salon if they'd be willing to put on your iPod while you get your hair and makeup done. I had a few songs I wanted to hear on the day of my wedding, and I was glad I got to listen to Rufus Wainwright and ABBA while I got ready, like I'd always wanted to do. 7. Be afraid to give feedback to your beauty consultants. I thought my blush was a little too brown, and we were both happier when she switched to a pinker shade. 8. Eat chocolate chip cookies in the limo, unless you have stain-fighters on hand. Trust me on this one. 9. Overschedule the reception. After the first dance/cake cutting, enjoy yourself. 10. Be afraid to give your speakers a time limit ahead of time. Your guests will thank you. 11. Worry about greeting every guest at the wedding. I said hello to my husband's and my friends and greeted my extended family and parents' friends when they came up to me. They didn't seem to take it personally that we didn't stop by at their tables. We wouldn't have been able to eat, otherwise! 12. Worry about the first dance if it isn't your thing. The idea of taking dance lessons and being under the spotlight for two complete songs sounded like torture to me. My fiance and I picked a song, danced a few bars, my father cut in for a few bars, and then all the guests were invited to join us, so my alone-time on the dance floor was mercifully short. 13. Freak when someone steps on your gown. It's going to happen. Again. And again. By the end of the evening, if you're enjoying yourself the way you should be, you won't even care. 14. Worry about matching your thank you note stationery to your invitations unless you must. I'm not sure who came up with the rule that every thing in a wedding, from the save-the-date cards to the invites to the seating cards to the programs to the stationery, has to match. Maybe it was a crazy person. 15. Just write thank you notes to the people who gave you gifts. If you felt especially moved by your rabbi's speech or the care the coordinator at your reception location gave you, let them know. 1. Assume that something will go wrong. It's going to happen. Accepting that fact will make your life easier. Our venue got changed the day our invitations were mailed. Fortunately, it was moved to a church across the street. We sent out notes alerting guests to the change, and everything went fine. It wasn't that big of a deal, and it felt good to get that mini-disaster out of the way. 2. Have an engagement photo session with your photographer. Even if you have no intention of submitting your pics to the local paper, it's good practice. You'll get to know your photographer, and you'll get the hang of those lovey-dovey shots with your spouse-to-be. 3. Happily support your friends who get engaged during your engagement. They're not stealing your thunder, they're joining a team of people whose opinions you can elicit and won't get tired of talking about wedding stuff. If you feel like your wedding is going to be "less special" because someone else is getting married this year, maybe you're not mature enough to get married. 4. Get over your "dream gown." Odds are the dress you saw in the magazine looks totally different on you. Trust your experts, and your own eyes. While I wish that Oscar de la Renta gown didn't make me look eight months pregnant, I didn't fall apart over that fact. 5. Periodically cull through your wedding binder and throw away things that are no longer relevant -- dress ideas after you'd purchased your gown, honeymoon articles after you've already booked the trip. Unless you enjoy scoliosis. 6. Get the itinerary down ahead of time. You want to make sure everyone knows where to be for the getting ready, the pictures, the church, the speeches, the cake, and so on, so you're not chasing people down all day. 7. Spend some "you" time right before the wedding. The days leading up to my wedding I couldn't sleep, was losing weight (which I didn't want to do), and was going to the bathroom all the time. The night before the rehearsal, I scheduled a scrub and massage and hung out at my maid of honor's house with a bottle of wine. It was exactly what I needed and great to laugh and talk to one of my oldest friends about the excitement ahead. 8. Make sure you have someone who knows what they're doing at the rehearsal. Our priest did not show up -- he was delivering last rites to a parishioner -- but fortunately the chapel coordinator/cantor led the rehearsal for us, which saved me from a meltdown. 9. Tell your bridal attendants ahead of time what you hope the tone for the day will be. I would have felt weirded out if everyone was squealing and crying. I wanted things to feel as normal as possible, in case I got nervous, and my friends were great for this. They reassured me, teased me, and helped me. I'm eternally grateful. 10. Carve out some peaceful time in the morning. I wanted to start my wedding day on a calm note, so I took a walk and read the New Yorker in the backyard in the sunshine before we went to the salon. I think the day would have been different had I jumped out of bed and started running around right away. 11. Eat breakfast and lunch on your wedding day. No fainting at the altar. 12. Make sure that you have someone on hand who knows how to bustle your dress. I sure couldn't have done it myself. Invite your mother or maid of honor to the final fitting for this reason and bring them a notepad to take notes. Hopefully, they won't think you're totally neurotic. 13. Make it a priority to enjoy yourself on your wedding day. The bride sets the tone for the entire wedding. If you're having fun, everyone else will. People told me I looked like I was having a great time. If you're stressed, it'll be written all over your face. 14. Try to make sure you'll get a few minutes to enjoy the cocktail hour of your reception. You spent all that time deciding on your shrimp boats and mini pizzas. You may only get 15 minutes to enjoy them, but that's better than nothing. 15. Talk to, smile at, and flirt with your spouse during the ceremony. This is IT! You should have fun and break the formality, within the realms of propriety. 16. Have a pair of comfortable shoes to change into. You can't "break in" a pair of three-inch heels. Eventually, your feet are going to hurt. 17. Ask the caterers ahead of time to set aside a take-home meal for you and your groom. For months, I looked forward to the moment when I could get to our hotel, get out of my gown, and eat my leftovers. I was not disappointed when the big moment finally arrived. 18. Thank everyone who isn't getting paid to help you with your wedding -- over and over and over again. It's an honor for you to have your loved ones surrounding you on your wedding day. 19. Have a master guest list with addresses on hand, in hard copy and online. It will be invaluable when it comes to writing thank you notes. Keep the hard copy in a heavy-duty envelope, because you'll be carrying it around and taking it out again and again. I kept mine with a stash of stationery, stamps, and the little booklet I used to keep track of who gave me what. 20. Enlist your soon-to-be spouse to pitch in with the thank you notes. He/she will be enjoying the gifts too, right? I ended up writing a brief outline to thank-you-note writing for my fiance, since he wasn't as used to writing them as I was, but once he got some practice, his were funnier than mine.